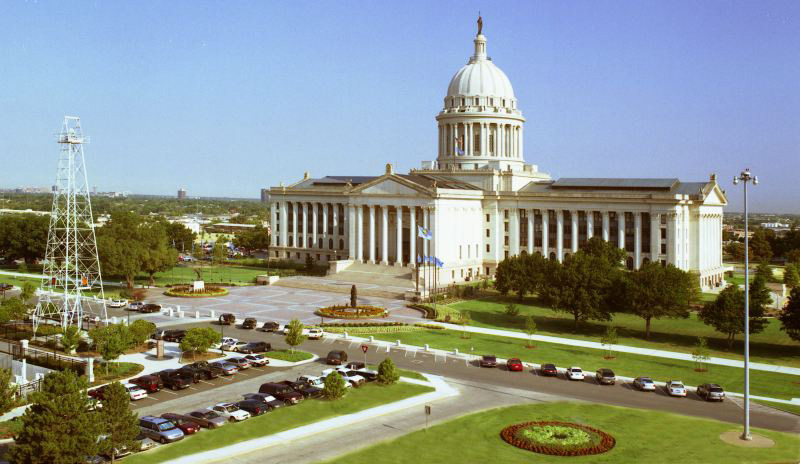 Located on more than 100 acres in NE Oklahoma City, the Oklahoma State Capitol is the only capitol in the world surrounded by working oil wells. One is even named Petunia #1, because it was drilled in the middle of a flower bed. The architecture is Greco-Roman and the structure comprises 650 rooms and 11 acres of floor space with murals, restored stained glass, tribal flag plaza and changing art exhibits. The current site was chosen in 1915 and construction was completed in 1917. Construction of a dome was completed in 2002, a feature that was included with the original design plans of the building but never completed. The Oklahoma Veterans Memorial is also located on the North side of the capitol complex. Four walls depicting the scenes of WWI, WWII, Korea and Vietnam wars are featured, along with a bronze statue of "The Big Guy" who stands eight and a half feet tall on a three and a half foot pedestal. His bronze face has the features of a Native American and he wears the gear of a Vietnam soldier. Self-guided tours are available Mon-Fri 8am-5pm and Sat-Sun 9am-4pm. Monday through Friday, trained volunteers conduct informative 45 minute capitol tours at 9am, 10am, and 11am and 1pm, 2pm and 3pm. Additional contact number for State Capitol information: (405) 521-3356. The above information is from Oklahoma Travel & Tourism site and you can access the page by clicking here for more information!